As one-half of the longstanding alt-rock act They Might Be Giants, John Flansburgh has spent the last 30-odd years of his life both educating and entertaining discerning listeners. 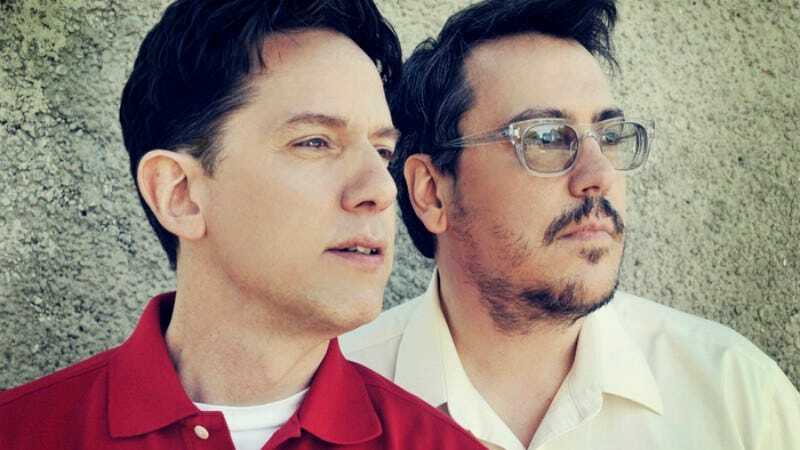 2015 is a bit of a renaissance year for TMBG, with the group reviving its popular Dial-A-Song program, touring the world, and releasing three albums over the next two years. The group is also currently sponsoring a Dial-A-Song video contest, inviting fans to contribute a video tribute to its new song “Erase.” Entries for that are due April 7, and the group kicks off its spring North American tour in April 16 in Pittsburgh. John Flansburgh: The worst job I ever had. Wow. I basically had really bad jobs from 16 to 25. I don’t think I did any job for more than a year, year and a half. It’s sort of like an eight-way tie for last. The A.V. Club: Can you give some examples? AVC: That’s one you’d think would be fun. JF: My boss was Morris Levy, who is actually a chapter in the book Hit Men, and it was not only drudgery, it was also really, at times, extremely creepy. I also worked for a couple of really big publishers doing paste-up, which is a job that doesn’t exist anymore. There were actually days of my life where I would be literally touching up illustrations of the face of ALF. Either removing the mole from his face, making the mole from his face smaller, or taking the hair off of the mole on his face. AVC: Why? What was that for? JF: They were making ALF workbooks for children. It was educational material. So we would be churning out 120-page books every couple of days. There would just be someone doing illustrations on math, and I mean, a bunch of the workbooks actually involved ALF the character, the television alien. So they would sort of make a stylistic choice about how to draw him in cartoon form, and then they would change their mind. So my job, along with slapping pieces of wax paper onto big boards and paginating them, was also doing illustration touch-up. The most miserable job I ever had was when I spent three months of my life removing staples. I was working for this medical records company and they were moving all their files over to microfilm. But all the files had things that had been stapled once and then stapled again and stapled again and stapled again, and so everything was sort of a 10-page, five-staple set of medical records. And they needed to take all of the staples out to feed them into the microfilm processer. It was such a cruel job. There were two of us doing it, and the first couple of weeks we were doing it, they actually put us in separate rooms and wouldn’t let us talk because they didn’t want us to be distracted, which is an amazing idea. And they wouldn’t let us listen to the radio. It was kind of like being in solitary confinement with a staple remover. But over the month they kind of loosened that up, and we got to gossip and talk. But it was still a terrible job. Actually, I worked as a busboy for a year, and in spite of the fact that that’s a very familiar job, that might have actually been the worst job. JF: We were working split shifts. You would basically get there at 11 o’clock in the morning and leave at 1 a.m., but somehow they would manage to shave four hours off that pay, and you couldn’t really go anywhere. It was just a horrible job. Horrible working conditions. The only way you could take a break off the floor was if you smoked, so I had to pretend that I smoked, which is super-weird. It just seems so arbitrary. I just remember that was spiritually the most depleting job. Lots of jobs are weird and put you in weird places, but at least you can be with your own mind. I learned how to play the guitar working in a parking lot. I was the guy in the little booth in the parking lot at night, so basically very few people were coming in or going out, so I just kind of sat there with my space heater and my Fender Mustang and learned how to play music. So that was a good job. I mean, for a bad job, that was tolerable. AVC: At least if you’re just taking out staples you can think and let your mind wander. But as a busboy, you have to deal with gross food and weird people. JF: Yeah. And gross people. Also it was just physically really hard. It was like working construction—with food. AVC: There are some waiters and bartenders who are 70-some years old, and you always have to wonder how they’re still doing it—unless they’re working somewhere where they make great money. JF: Yeah. Although when you get an older waiter who is highly competent, that can be kind of exciting. I also worked as a bar busboy in a place that had… like these drunks would roll in at 11 o’clock in the morning. They were weird Boston beer drunks. They would drink beer in the morning and their food of choice was always apple pie with melted cheddar cheese on top. That was just what they would have for breakfast. And this was a standard thing, like everybody knew what this was and why it was that way, and it seemed so curious to me. I was like, “That is a very strange choice for how to live your lives.” Get to the bar at 11 in the morning, start drinking beer ferociously, and eat apple pie with cheddar cheese on top for breakfast. AVC: Did you ever try it? The pie, not the drinking. JF: No, I never did. It seemed kind of gross. I think now, as an adult, I feel like my palate could be a little more sophisticated. I see how it’s kind of like General Tso’s chicken or something, you know? A delicious, savory, sweet, and salty confection, but at the time I was like 17 and it just seemed so awful. JF: Oh, that’s a funny question! Is that officially the way the question is worded? AVC: That’s officially the question. JF: Because you know there is an old journalism school trope, which is “Don’t ask a question with a supposition in it, like ‘Why are you still beating your wife?’” It’s the example that people always give because you’re locking the person into the idea. AVC: Some people have said they still don’t feel successful. JF: I think one of the reasons people go on is they don’t feel like they’ve actually reached their goal, you know? I think, being in a band, you get some pretty frequent reminders of exactly how unsuccessful you are. Probably the most successful I ever felt was the job I had right before the band took off, which was when I worked as a graphic designer at Condé Nast. I worked at Self magazine. It was actually something that I had trained professionally for, and I was good at it, and I got paid a lot of money, and it was really, really comfortable. You know, the whole Condé Nast thing is extremely successful. I think I was actually one of the only people who didn’t go to private school on the staff, which was an interesting cultural education for me. It was such a great job. It started really late, we broke for paid lunch that we often all took together and that went on for a really long time, and then the last couple of hours of the day we were allowed to do our personal work in the office, so I actually laid out the album covers for our second album in the office. Everyone was really into my band and was very supportive. It was really a hard job to leave, and I actually never quit. I started touring, and touring just kind of took over my life, and when I came back, somebody else was at my desk. JF: I was like, “Oh, so you guys don’t need any hours from me this week?” It was like the best freelance job ever. And it paid so well, it was crazy. I’d spent so long being broke, and it was so exciting to not be broke. And getting into a van and traveling across country in an alternative rock band was not really the solution to broke-ness. AVC: You said that being in a band you’re reminded often of how not successful you are. What do you mean by that? JF: I think if you’re not on television, the average television watcher is very unimpressed with people that they don’t recognize. There are different levels of culture-making. And I feel like we’re actually in a relatively faceless one. But, you know, success is different. I feel like we’ve connected with an audience and we’ve had a fantastic career, and I feel like, in many ways, we’ve got the world by the tail. But on another level, I’m very aware of how few people actually know who we are. AVC: But would you want to be a headlining-Lollapalooza-size band? Would you want to do what it takes to get to that point? I’ve asked other bands that. JF: And what lie do they tell you? AVC: Some people say no. JF: I don’t know. That’s interesting. And people say no, they wouldn’t want to be? JF: Right. Right. I mean, I’d say when I think of bands that are really, really big, like whether it’s Prince or U2, those acts were contemporary with the time that we were coming up in the music scene, so I guess I think of their success and their levels of success. Or even the Pixies. The Pixies opened for They Might Be Giants. We saw their cultural ascent and it was very exciting, because personally I actually felt like our side was winning. It was Rod Stewart’s world and he was trying to keep everybody out. But when I think about bands like U2, you realize that the people who can fill the arenas really are communicating to the people in the arena. They write stuff that works for them. JF: The first time we got nominated for a Grammy, John Linnell and I were wondering what we would say if we won. And he was saying that he wanted to say, “Don’t lift yourself up by pulling on the seat in front of you in the airplane.” Just as a public service. Like if you have a chance to speak in front of a large crowd of people, you could actually move the culture forward. This is not villainous, but if I could change one thing in the world, I would reengineer cell phones so the person talking could hear their own voice in the earpiece of their phone. JF: As someone who grew up with landlines, I can tell you: Hardwired phones were engineered and designed to give you the confidence that you were being heard—which is why people would whisper into their phones and know that they were being heard because they could hear their whispering voice in the earpiece as loud as they could hear their regular, full-volume speaking voice. It was compressed and loud and audible. And it’s a little bit of a reassurance that you’re being heard. The limitations of cell-phone technology are such that your voice would be delayed if you heard the actual, real signal. It’s not coming back in real time. So they just make the receivers dead, like you only hear the other end of the line, which is why everybody shouts into their cell phones. Nobody shouts into landlines. You can be in a phone booth by a highway and you can just talk and you can tell that people can hear you. But when you’re holding this dead object that is the cell phone, it makes you scream. And this is a very low-cost engineering solution to the problem of cellular telephony. I’ve thought about it a lot. AVC: I hate the fake sounds they insert into modern technologies, like how there’s a shutter sound when you take a picture on a cell phone. JF: Or like the record-needle-being-swiped-off-the-thing sound effect? AVC: Or when you dial on a cell phone and the keys make the sounds? JF: Because you’re so much of the modern world you don’t find those things comforting? JF: The thing that you’re talking about that is most diabolical to me—and it’s absolutely ubiquitous—when you see someone talking in a movie or on a television show or in a television advertisement, and they’re talking into a public address system or into a microphone. And they step up to a microphone in a public address system, and there’s this little bit of feedback that they put in to just remind you that it’s a microphone. That’s just not how the world goes. Because, basically, if there’s a little bit of feedback usually that’s what happens before there’s a lot of feedback. It’s just very dumb. JF: I was pretty manic most of the time. I really had great friends, and I really enjoyed making stuff. AVC: What kind of stuff? Songs? JF: I didn’t really figure out how to do the songs until later, but just drawing and writing and making cartoons. I just liked doing stuff like that. I became very obsessed with tape recorders and sound reproduction and the radio. I just was really into mechanical sound reproduction. I bought a little 3-inch reel-to-reel tape recorder when I was like 9, and continued to buy tape recorders for my whole life. AVC: That probably explains why you want the phone thing, in a way. JF: Yeah, it does make a lot more sense in retrospect. None of it made a lot of sense at the time. I remember when I was first buying tape recorders, people would just be like, “Why?” Like, why do you want a tape recorder? And I would record everything. I would record the television, I would record the radio, I would record people talking, I would record telephone conversations. I was just absolutely obsessed with it. JF: This is such a weird one. I really liked Shirley MacLaine, which is something that I never thought about as a young man or as an adult. I never reexamined the idea until that whole manic pixie dream girl essay came up. I find that whole discussion, just from a feminist point of view, very interesting, because I realize that I really mistook Shirley MacLaine’s classic manic pixie dream girl-ness for realness. I didn’t think it was a fantasy. I thought that was a special kind of woman in the world. I guess I just fell for it, you know? I fell for it, and it just seemed like such a fantastic, great thing. And now I realize it’s just a mirage. AVC: Well, she’s a little out there. She’s psychic, or she thinks she’s psychic. JF: Oh, I mean the characters she played. Like in The Apartment. She literally had a pixie haircut, you know? When she was in Irma La Douce. She was really classic manic pixie dream girl—a lot of her early roles. Not the later real-life Shirley MacLaine. JF: Are you familiar with the outro music to The Gong Show? It’s this weird kind of gospel vamp that sort of just goes like, “duh-du-du-du-du, BAH! -du-du-du-du, BAH!” It’s just got this crazy sort of punching horn stab in it. It’s a fantastic piece of music. AVC: Is it coming out around the Fourth Of July? JF: It’ll be out before the Fourth Of July, I hope. I was actually rewriting the chorus part of it. Kimya’s part is this long sort of… I don’t even know how to describe it. It’s sort of this rattly, long-winded verse that has a lot of really interesting, odd imagery in it. And then there’s a chorus that’s sort of set up like a rap song, really. It’s got this colorful set of ideas and then there’s a hooky chorus. And I’m trying to figure out how to make the chorus actually hookier. So I’ve been rewriting that. I actually got up very early to work on that. I’ve got it all cued up. I think it’s actually going to be better. AVC: Is it already recorded, or are you demoing it? JF: We made a demo and I sent it to Kimya, and she’s going to record her vocals momentarily, and I have the tracks to the demo sort of set up, and I basically just excised the chorus as it existed in the structure of the song and now I’m going back and filling it in. We work on computers, so there’s a flexibility in how you can demo a song that we take full advantage of. AVC: Have computers changed your writing process over the years? JF: Actually we started working with drum machines very early on, and there’s always been kind of a little secret handshake between us and automatic music-making devices. I bought a Dr. Rhythm machine in 1982 or something like that. That was a programmable drum machine, but we also had drum machines that were made for organists to accompany themselves, and those were always something that we worked with. I was actually listening to one of our earliest demos and I realized we made some demos early on with a record called DrumDrops that was a drummer just playing generic beats. It was not that different than going into Garage Band and hearing a drum track, and going, “Wow, that sounds so real.” This guy would record drum tracks and you would kind of play along to them. And we would just make up songs to these drum tracks. So there’s always been a little bit of that. I think we’ve used tape recorders and drum machines as compensational aids for a really long time. It’s just a fun way to work, and it’s funny because I don’t think people think of us as a techno band exactly, but the truth is that because of midi and computers and drum machines we got to do the things that we were doing. We would have been a very different band if it weren’t for those things. JF: When I was a younger, thinner man, I was often mistaken for MC Serch of the rap group 3rd Bass, in part because we both have really weirdly shaped heads and we both wore really strong black glasses. And it was interesting to be mistaken for him, in part because it made me realize how famous he was on the streets of New York. I don’t know how big they were outside of New York, but walking around Brooklyn with people mistaking you for MC Serch was… I was made very aware of how popular MC Serch was. AVC: He seems like a guy with a lot of good stories. He told a few good ones when he was on The Champs. JF: He’s a pretty passionate guy. I sat on a panel with him at the CMJ convention years back, and I couldn’t help but think, “Everyone in this room is looking at the two of us like, ‘Is this a joke?’” Because we really do share oddly shaped heads. AVC: Now that’s the look. Everybody has those glasses. JF: [Laughs.] It’s coming back. It’s coming back. JF: A couple of years ago we had friends over and one of them was a headhunter. Like her job is finding people to fill jobs that are hard to fill. She actually asked me if I ever considered becoming a brand manager, which was an idea that I didn’t even understand until she explained it to me. It’s actually a hard job to fill because it’s a weird skill set. I guess the thing about being a brand manager is that it’s kind of like being an art director, but it’s all about pulling together a concept for a brand. It’s very 21st century. I have to say—I’ve said this before because I was actually on a branding podcast a couple of years ago—but the term “branding” is like one of the worst pieces of branding ever. It’s such an ugly word. It lacks all poetry. AVC: And branding a cow is pretty horrifying. JF: Yeah. It sounds bad. I think ultimately what’s useful about having the term “branding” in the culture is that it makes people more aware and culturally literate about the forces of advertising on their perceptions. The reasons you buy things, the secret motivators. It’s not just somebody holding up a product and smiling. JF: I have a collection of bottle caps that were given to me by Peter Stampfel of The Holy Modal Rounders. He has a collection of… if you go online you can find out the number, but it’s in the many thousands. He has bottle caps from the first half of the 20th century. And he gave me a couple dozen of them, and I just have them below my computer monitor where I work. And I stare at them and they’re very strange and colorful and really from another time. I have red advertising measuring glasses, which is the eBay search to find these things. They’re basically cups that would be given away in stores, and they’re just kind of beautiful, and as a collection of things, they’re very beautiful together. They’re promotional glasses that were given away either by appliance stores or liquor stores or motor lodges or whatever. And a lot of times they might have measuring things on the side. When you have more than a few and you put them all together, the transparency effect of them is really something. I’m staring at them right now. JF: My first thought is if you say you want to eat at the all you can eat buffet, does that mean you can just hold off this execution? AVC: Well, there’s probably a limit. I think I would go for Steak Diane. Which is basically steak au poivre, which is a very simple French way of making steak but with this crazy Worcestershire-Tabasco-lemon preparation. That might just be what I have for dinner tonight. I might not have to wait until my last meal. AVC: Anything on the side or for dessert or to drink? JF: A Manhattan. Some mashed potatoes. Keep it simple. Bonus 12th question from Tori Amos: If you could only express yourself as an instrument, trusting that there was someone who could play you and play you well, what instrument would you be? For a year. JF: For a year?! Interesting. I would say a theremin. JF: Because it’s a hugely expressive instrument that has just a very singular quality to it. It’s like the violin or the human voice in its open-endedness. It’s the opposite of a fretted instrument or a well-tempered instrument. It’s not restricted to scale at all. And it’s electronic. JF: Who was the most unlikely person who has recognized or praised you? The reason I bring this up is because in the early days of MTV I was stopped in the hall by Adam Curry. AVC: It was like a lion’s mane. JF: I think the idea was that he was a bit of a himbo. He was a handsome, strapping young man. He stopped me and he said, “Look, I know you’re probably going to find this kind of hard to believe, but I really appreciate what you guys are doing.” And you know, you just kind of file that into your back pocket, like, “I’ll take that as a compliment.” I didn’t even know what to say back to him. Now, it emerges that he worked on the coding and protocol for podcasting. JF: Yeah! He’s a tech. AVC: He just happens to look that way. JF: He started a very early podcasting concern, sort of parallel to the Thomas Dolby story, you know? He made a bunch of dough with this podcasting thing. AVC: Do you think he was talking about your music, or about Dial-A-Song, or just about your whole aesthetic? JF: I have no idea. It was just confusing when it happened, and then 10 years later when I heard the story about him being part of the creation of podcasting, it just made me realize that there’s more to the world than it appears.